The Discourse about the Great Emancipation is a a newer translation of Mahāparinibbānasutta from the Pali Canon, the Sutta 16th, being the standard Theravada text on the last part of the life of the Buddha and his death. 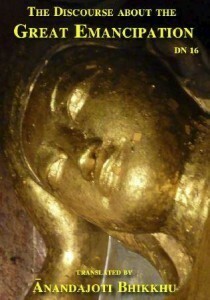 The discourse consists of both historical details and descriptions of advice for meditation techniques, directly given by the Buddha. It is one of the longest discourses from the Canon and it is here The Buddha makes preparations for the preservation of his teaching.